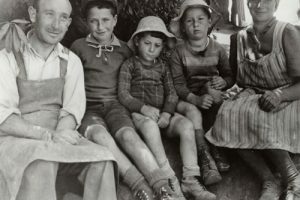 JDC records of grandparents provide framework for family’s Holocaust narrative. When I recently started working at JDC, I was delighted to find the JDC Archives Names Index on the JDC Facebook page. My interest in family and history encouraged me to research both my grandparents’ lives. In my maternal family, we don’t have heirlooms passed through generations, nor do we have many other family members to call up and ask for details. We have stories; stories that change slightly over time, and with years, places, even names forgotten. 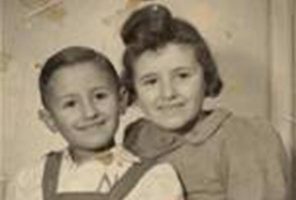 Both my maternal grandparents were immigrants, their childhoods rocked by the horrors of the Holocaust. My grandmother Ludwika Weiler came from Poland; my grandfather Herbert Schein from Vienna. 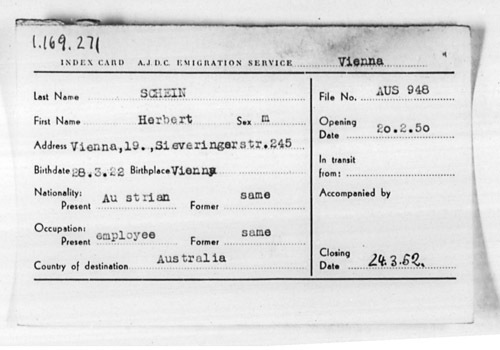 Herbert Schein’s JDC Emigration Service Card from Vienna. Their stories have provided an amazing framework, but I’ve always wished to learn more. Wonderfully, I’ve been able to do just that with the help of the JDC Archives. My grandfather was a part of the group of Jewish refugees from mainly Austria and Germany that found refuge in the ghettos of Japanese occupied Shanghai. 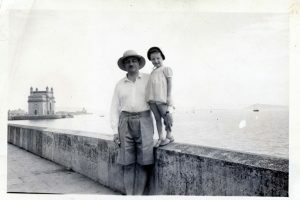 With the Names Search, I was able to add to my grandfather’s stories with supplemental information, like his name on a list of JDC case files from Shanghai or his JDC Emigration Service card from Vienna when he had to return to Austria from Shanghai after the war and again sought JDC help to emigrate. I also have become acquainted with Claus Hirsch, a volunteer at the JDC. Claus is also a Shanghai Jew, who lived in China at the same time as my grandfather. Though they weren’t acquainted, Claus’ stories are similar in nature to those of my grandfather. Claus is an amazing resource of answers and stories of a time and a place that many know so little about. Once weekly he goes through lists, aiding the JDC Archives in making documents accessible for those researching their pasts. My grandmother proved harder to find, as I didn’t see her name in the Names Index, which has records added to it weekly. The director of the JDC Archives, Linda Levi, showed me the advanced text search function on the archives website, and from there we were able to track down a cable sent from JDC’s Belgium office to its Warsaw office. 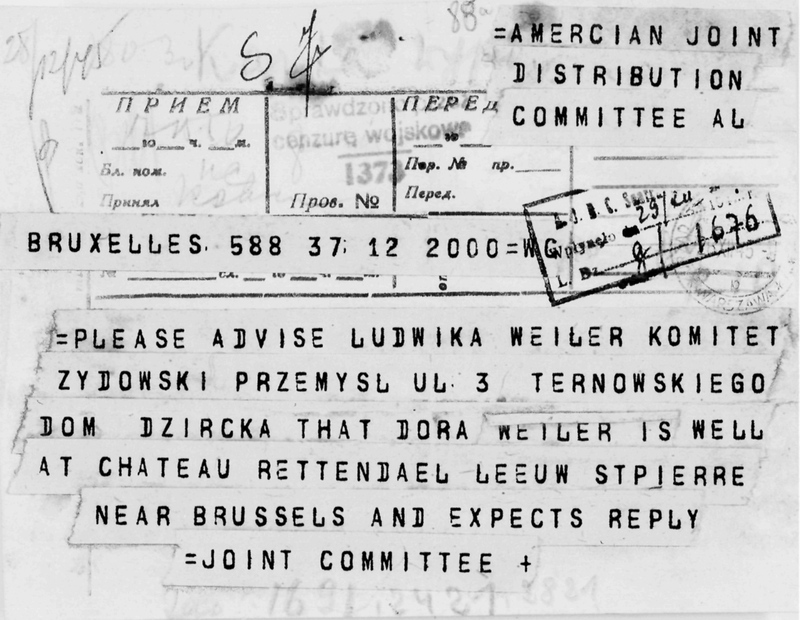 The cable asked the latter to reach out to my grandmother, Ludwika Weiler, who was in an orphanage at the time, to let her know that her sister Dora was alive and well in Belgium and that Ludwika should make contact. This document was located in the JDC Warsaw Office Collection in the immediate postwar period. These documents provided an important framework for me in my piecing together my family’s story. Furthermore, they elicited great excitement for both myself and for my family. We’ve had few items to supplement our stories, and think that the JDC Archives is doing necessary work in preserving primary source material that can enhance the memories and the stories of so many families. I’m thrilled that I was able to track down records about my family here at JDC. Miranda Carson, a former JDC Marketing and Communications Assistant, lives in NYC and works as an illustrator. This story has been shared with her permission.